In this article we’ll consider licensing peculiarities of the new generation of server OS family — Windows Server 2012 R2 when using the new model of the dual-processor licensing. Also, we’ll tell about the rules and order of licensing to use virtual machines as a guest OS with the support of virtual machines migration between hypervisors (vMotion, Live Migration, etc.). 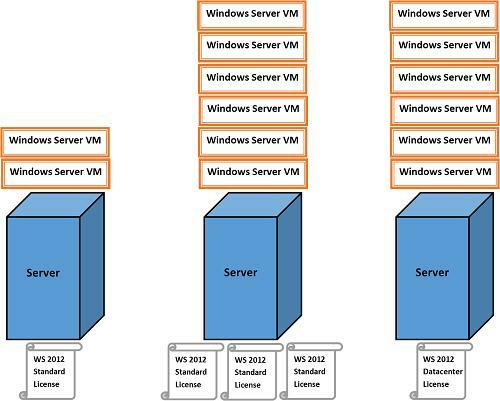 The licensing model for Windows Server 2012 was changed completely and what’s more important became easier. Now it meets the modern tendencies to extensive use of virtualization technologies. So, there are two basic Windows Server 2012 R2 editions: Standard and Datacenter. They are almost identical in their features, except for the licensing rights to run virtual machines. It means that you choose the edition depending on the density of the virtual environment instead the availability of the required features. In Windows Server 2012 R2 Datacenter on a single physical host with this license, you can run an unlimited number of virtual machines (recall that these virtual machines can be easily activated using AVMA – Automatic Virtual Machine Activation). 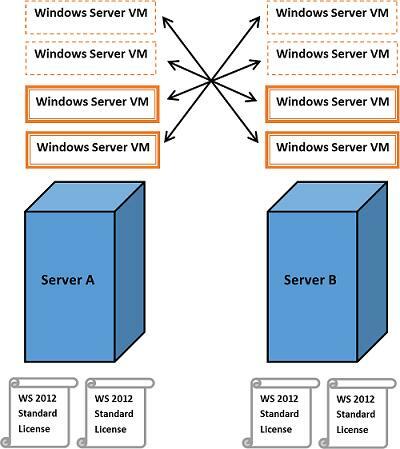 In fact, when choosing Windows Server 2012 R2 edition you need to decide whether you need virtualization. Note. We don’t consider Essentials and Foundation editions, since they are designed for small businesses. These OSs have a number of specific limitations and no rights for virtualization. It should be noted that Web Server edition has been eliminated completely. 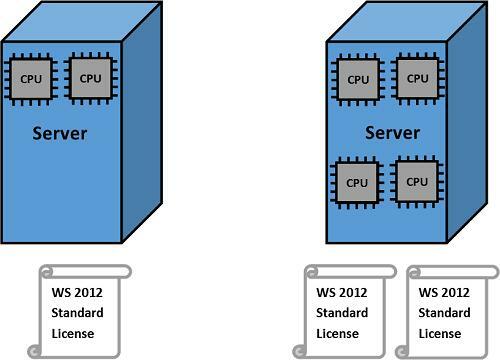 The next peculiarity of Windows Server 2012 R2 licensing — one license allows to run the OS on one single- or dual-processor server. I. e. one license is covers for up to two processors (sockets) located n the same physical server (cores are not the processors). You cannot divide one license for two single-processor servers (in this case you have to purchase two Windows Server licenses). If a physical server has more than two processors, you will have to buy one license for each pair of processors. For example, for a 4-processor server you will need 2 Windows Server 2012 R2 licenses. Virtual machines are not directly licensed. However, as it was discussed above, the Standard license allows to run up to 2 virtual instances of the product on a licensed physical host. The Datacenter license allows to run any number of virtual instances of the OS on a licensed host. What can you do if you need to run more than two virtual machines on the server under the Standard license? You will have to purchase the necessary amount of licenses assuming that one Standard license allows to run 2 virtual machines. For example, you can license a server with 6 virtual machines using 3 Standard licenses or 1 Datacenter license. The order of licenses covering the following: firstly, physical sockets should be licensed, only then instances of virtual machines. According to the current Microsoft prices, it is worth to buy the Datacenter edition if you are going to run 14 or more virtual machines on one physical host. 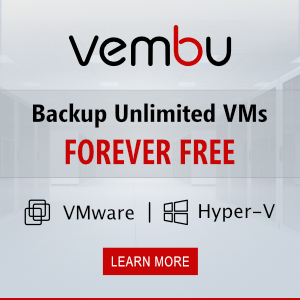 If the number of VMs is less, it’s better to get several Standard licenses to suit your demands. Further we’ll consider licensing peculiarities if the guest OS can migrate between the servers of a virtualization farm (using VMotion, Live Migration, etc.). Note. According to the licensing policy, virtual machines can be run not only on Hyper-V, but also on any other platform that you choose, like VMWare, XEN, etc. Thus, one Standard license on one physical dual-processor host with VMWare ESXi/ Hyper-V allows to run 2 virtual machines with Windows Server 2012 R2. For most Microsoft server products, Software Assurance (SA) provides the right to migrate the license between hosts. But Windows Server is an exception to this rule. According to the licensing agreement, the license can be migrated between the hosts once in 90 days. How to license a virtualization farm, in which VMs can migrate between hypervisors (host OSs)? In this scheme, you will have to buy that number of licenses for each physical server covering the maximum number of virtual machines that can be run on it at the moment (including the situation when all virtual machines of the farm “gather” on one host). I.e., the virtual machine licenses are linked to a physical host and do not migrate between the hosts together with the VMs. For example, for two separate single processor physical servers with two virtual machines on each of them, we’ll need 2 Standard licenses. However, if the virtual machines can migrate between these servers, we’ll need 4 licenses (providing that 4 VMs can be run on each server simultaneously). As to the Datacenter license, 1 license will be enough for each physical host, since it allows to run the unlimited number of VMs. The suitable license type is chosen based on the planned number of VMs in the farm. If necessary, you can downgrade Windows Server 2012 R2 to Windows Server 2008 R2. The Datacenter license is converted to the same Datacenter license, and the Standard one can be converted to Enterprise or Standard license. 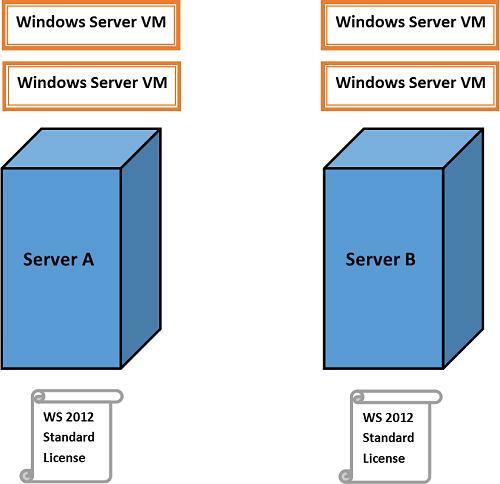 The rules of virtual machine licensing are the same to Windows Server 2012 R2. So if i have one VM in cluster of two nodes and fail happens VM migrates from first node to second host node. Do i need call MS and activate it with key from second node? How long will be grace period for VM on second node? The virtual machine must be activated only once. When VM migrate to another host in cluster reactivation is not required. why my windows server 2012r2 standar only read 2 phisycal processor , if I have 4? Windows Server restricted the maximum number of processors to 64, both for Standard and Datcenter editions. Check the BIOS settings. If your server is virtual – check virtual hardware configuration. Maybe do you modify the “msconfig -> Advanced options-> Number of processors” in your Windows Server? We are using Proxmox (KWM) installed on three server dual core. We have two phisicals server with one Windows 2012 R2 standard and one phisical server with Windows 2012 R2 standard. total 30 devices that will be connected. May you help me about license? Microsoft Support have not helped me. According to the last situation, if I have 3 physical server as a “migratable” VM farm (traditional VM environment) that runs 2 VMs on each physical server (total 6 VMs), then I have to buy 9 licenses to allows 9 VMs running on each single server. Is that right?